Who doesn’t like a good homemade soup on a cold winter day? Especially if you have been out dealing with the crowds shopping this time of year. It’s nice to kick off your shoes and curl up with a warm bowl of homemade soup. 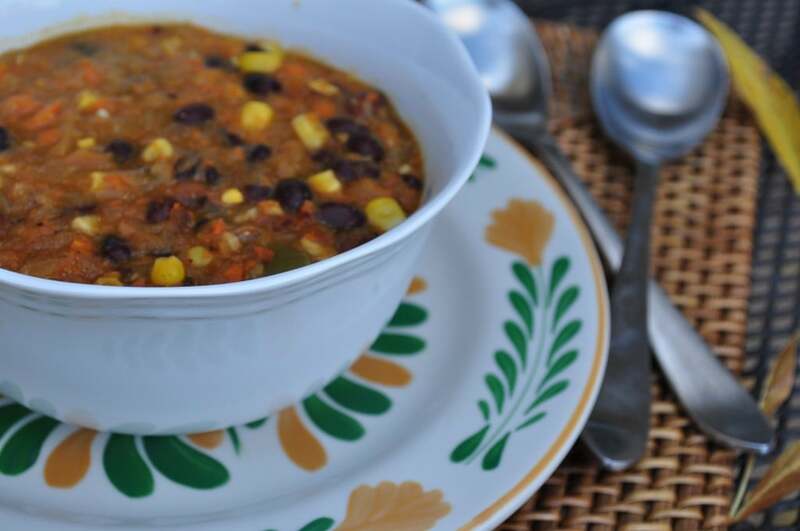 This Black Bean Vegetable Soup is the perfect comfort food to warm you up. We made this soup with vegetables we had gotten in our organic co op basket. My husband wanted to do the Mexican add on this week, so this soup has a bit of a kick. Just a warning. Personally, I am quite wimpy when it comes to spices. Growing up in Boston, we didn’t eat much spicy food. So this is more a soup for my husband than for myself. It made about 5-6 servings so you could freeze some for later if you want. I actually do that a lot. So here is the recipe. To save my eyes from burning, I usually cut the onions in the food processor . In fact, if you want to make it easy, you can chop the veggies up the night before. Once the beans have been cooked to get a little softer, throw everything in the crock pot and cook on low for at least 4-5 hours. You can cook it on high for 2-3 hours if you wish. The longer it cooks the more flavor the soup will have. This should last at least a week in the fridge and up to 6 months in the freezer. That’s it. Do use dried black beans or canned? Thanks! Can i use canned tomatoes, if so how much? Sure! You can use about 2 cans of diced tomatoes. Do you have a recipe for making vegetable stock or do you use store bought stock. I make my own sometimes. I don't have a recipe on the blog yet. I have plans to put one up. When I buy store bought broth, I get Pacific Organic vegetable broth. There is no MSG and no scary additives. Thanks. I usually use Trader Joe's Organic vegetable broth. The ingredients look pretty safe. I would like to make this soup, but I have concerns that the black beans would fade making the juice on the soup black & look unappetizing. Do you have a problem with the black beans fading? I can't recall having a problem with that, but it's been a while since I made this soup. The dried beans don't have to be soaked first? All I have on hand is ham stock. Could I use that as a substitute? Sure I think that should work. Do you measure 3 cups of beans before or after soaking, they swell up after soaking. I believe it was after soaking. three cups after soaking would have been good to know BEFORE I dumped them all in. That is not something everyone would know. Details people, Details! If you have extra beans that have been hydrated, you can freeze them for later use. I have the soup simmering on my stove right now. Can't wait to try it. Have you heard of the Vidalia Chop Wizard? Amazon has it and its GREAT for chopping veggies fast with out pulling out the big food processor. It has 2 different inserts for large and small cut sizes. We LOVE ours! I have some kind of chopper thing like that. I use mine to cut french fries. I hope you enjoy the soup! The soup is AWESOME!! I love it!! Thank you!! Does the one chipotle chili make it very spicy? I'd like my 2.5 yr old to eat it too but I'll omit the chili if it's too much. It does make it spicy. I would omit it if you are concerned. I used canned beans and canned tomatoes. I also added 2tbs of tomato purée. It was so good and so easy. Also used half a jalapeño which was perfect. 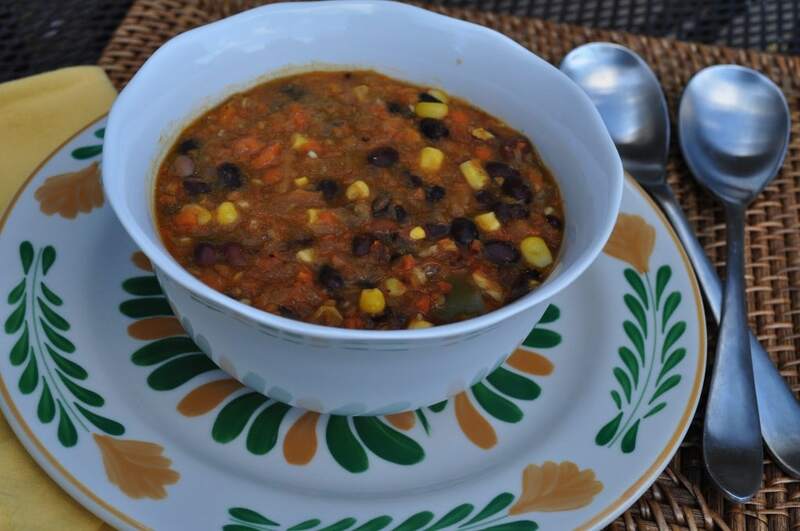 Could I use canned black beans for this soup, and just throw them from the can into the crock pot with the other ingredients and be good to go? I notice a lot of recipes call for dried beans but I've never used them.